Nike is set to release a new version of its classic Benassi slider sandals, featuring miniature fanny packs across the toe straps. The sliders feature a zip pouch for each foot, creating storage for small items such as keys or cash. Called Fanny Pack, they clearly reference bum bags, an accessory that is usually associated with the 1990s. Nike has not the revealed an official launch date, but the sandals will be available in three colourways: black, black-pink, and green-blue. But the design has already caused a stir online. 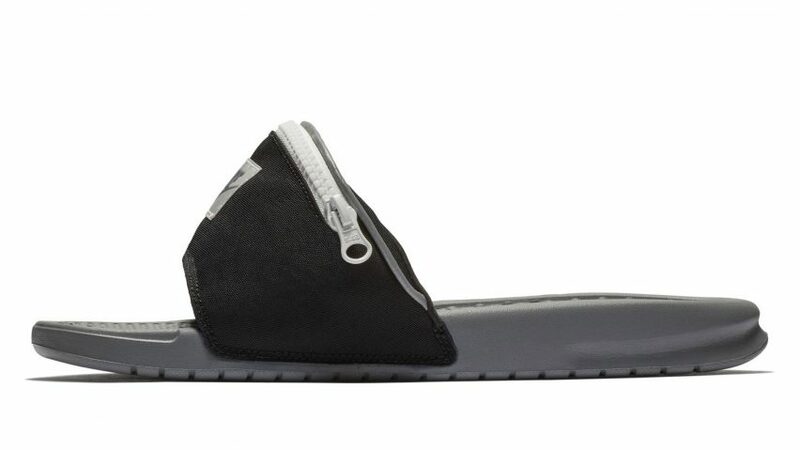 News outlet Metro dubbed the sliders "dad fashion", while design magazine i-D called them "the ugly summer shoe we need". They have also attracted the attention of Canadian politician Norm Kelly, who posted on Twitter: "Why did Nike put fanny packs on slides? Do I need them?" Nike ranked at number 37 on Dezeen Hot List 2017. The sportswear brand has released a number of innovative products in the past year, including a pair of running shoes with 3D-printed uppers and a shoe for disable athletes. But it has also been known to launch playful products, from Back to the Future-style self-lacing shoes to trainers featuring the font used by Transport for London. Fanny Pack taps into the current trend for fashion designs that are regarded as both ugly and cool. Other recent examples include a T-shirt with a shirt attached to its front, launched earlier this week by Balenciaga.